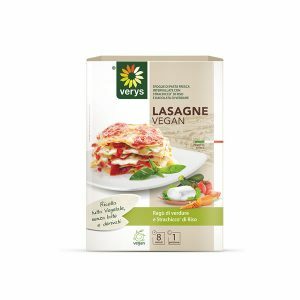 Vegan Lasagna with vegetables is the perfect Ready to Eat Meal to enjoy at home for a vegan dinner or just to change your habit trying a new taste. Lasagne are rich in nutrients and with taste which recalls the traditional recipe. Our 100% vegan Lasagne are very digestible and free of animal products. ​Tomatoes used in the filling are 100% italian, while the faboulus bechamel is 50% made with Vegan Spreadable Classic which confers a unique texture, taste and creaminess. ​Lasagne are best when heated in conventional oven and served hot but you can enjoy them at room temperature as well. Keep them in the freezer between -18° C e -6°C. discover LASAGNa with vegetables raGÙ and STRACHICCO! Bechamel: (BioSurice > water, germinated whole rice 20,8%, salt, apple vinegar), coconut oil, Kamut flour, Iodine salt, nutmeg. Vegetable filling 36%: Tomato pulp, zucchini, carrots, onions, extra virgin olive oil, Iodine salt, pepper. Strachicco 12%: (BioSurice > water, germinated whole rice 20,8%, salt, apple vinegar),water, coconut oil, rice syrup, lemon juice. Wheat semolina, water, rice flour. Preparation Traditional Oven: Unwrap and place Lasagne in a ceramic plate or similar container. Pre-heat the oven up at 200°C and place the vegan Lasagne into it for 8 minutes. Microwave Oven: Place the container straight into the microwave oven and heat it up 120 seconds at max power (1200W).